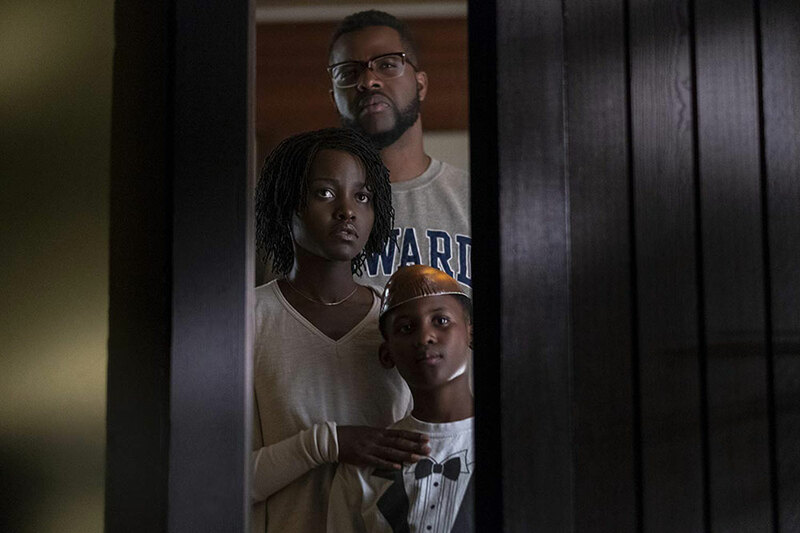 Our staff heads to the theater to check out “Us”, Jordan Peele’s highly anticipated sophomore film, to discuss and debate if it lives up to the hype. Depending on who you ask, Jordan Peele’s directorial debut Get Out (a film he also wrote) is either a masterpiece of socially conscious horror heralding the arrival of the next great auteur of genre filmmaking, or it’s a vastly overblown “not really horror” thriller that owes its tremendous success primarily to the current cultural/political climate (rather than the actual merits of the film). 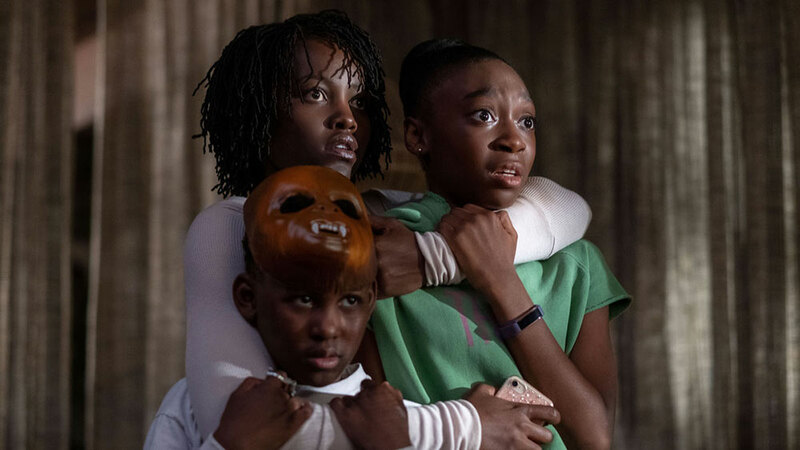 After cleaning up at the box office, winning an Academy Award for screenwriting, and prompting heated debate over whether he might be a contender for the title of the next Master of Horror, Peele’s follow-up film Us could not have arrived with more anticipation — or with any higher stakes for the filmmaker. Was Get Out a fluke? Is Peele capable of delivering as much terror as social commentary? Can he deliver something different that reflects his range and versatility, while still maintaining the magic of his celebrated debut? Us seeks to answer those questions and provide a clearer picture for Peele’s future success in the genre. His new film, starring Lupita Nyong’o (12 Years a Slave) and Winston Duke (Black Panther), made its World Premiere at SXSW just a couple of weeks ago. It received immediate critical praise, quickly earning a 94% Rotten Tomatoes score and outstanding reviews. But it’s not just those ‘snooty’ critics who have embraced the film. It’s also winning the hearts of audiences, while shattering box office records left and right. 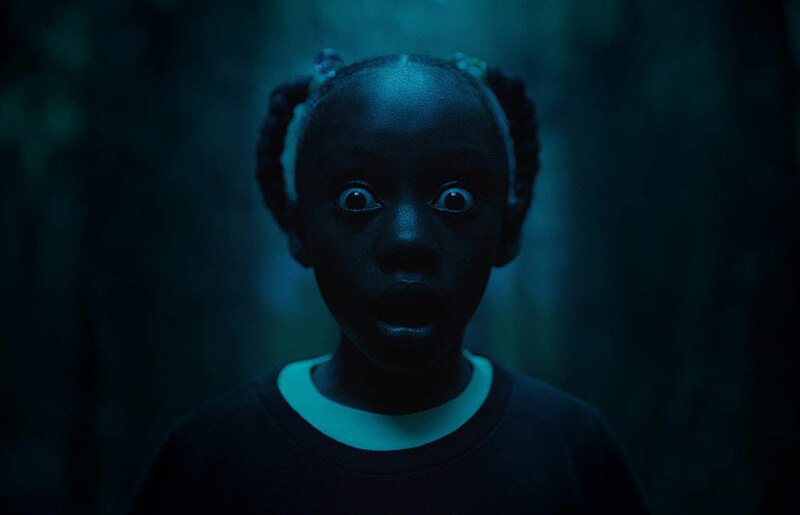 From the film’s opening on March 22, 2019, throughout its opening weekend, it has amassed over $70 million nationwide — breaking box office records for horror films and live-action films in general, nearly matching Avatar‘s $77 million opening weekend in 2009. Of course, with a film this hyped and this buzzed about, expect more debate about whether this film, like GET OUT, is really worth all the accolades. Is it a masterclass in horror or a pretentious arthouse thriller? Will US bring new fans over to team Peele or reinforce the belief that his genius is overrated? Our team weighs in below, with six different takes on the film. However, like GET OUT, it’s probably best not to know too much about the film before going in. So you may want to see US for yourself first before reading our thoughts. Given the insta-classic status of Get Out, my hopes for Us were high. I was not disappointed. Us is a meditation on class, the individual, and the fate of society all wrapped up in a freaky tale that has its roots in some of the oldest myths there are. When the Wilson family takes a vacation to Santa Cruz, mother Adelaide is reluctant to go to the beach, the site of a traumatic event that happened when she was a child. After a brief scare and a series of coincidences, her uneasiness grows until a mysterious family appears in the driveway. These strangers are rough-hewn clones of the Wilsons, versions of themselves who have lived as shadows in subterranean tunnels. But the tables have turned, and the Tethered (for that’s what they’re called) have come to reap their revenge. What could have easily been a simple home invasion movie expands scope and meaning. Noting the duality of his subject, every aspect of this movie has two or more meanings, like mirrors reflecting on themselves. Even the title is also a reference to the United States. Between the bold imagery and the nods to horror classics, every scene has something hidden for those willing to look. But sometimes those flourishes can distract from a well-told tale. In that sense, GET OUT, being more restrained, is still the better of the two films. 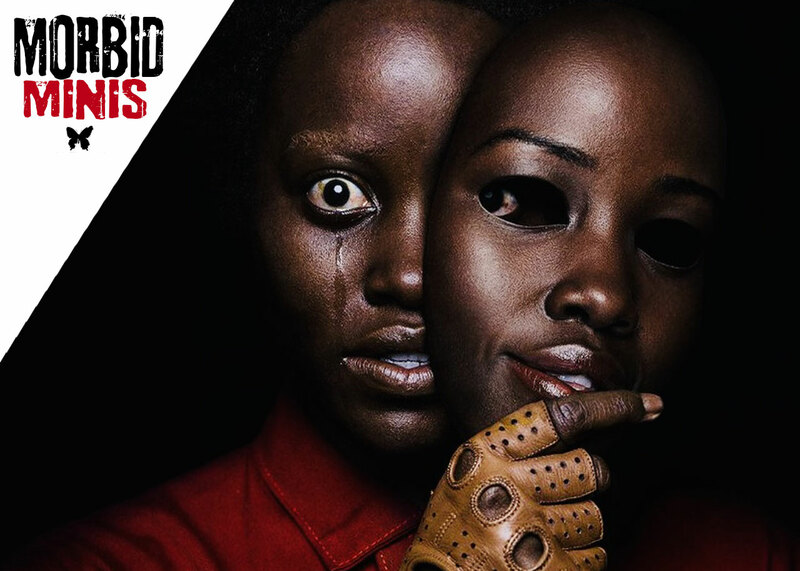 With Us, it sometimes felt like Jordan Peele was throwing every creative impulse at the script, and it would have been more effective with some judicious editing. TAKE TWO: WHAT’S TO LOVE? WHAT’S NOT TO LOVE? 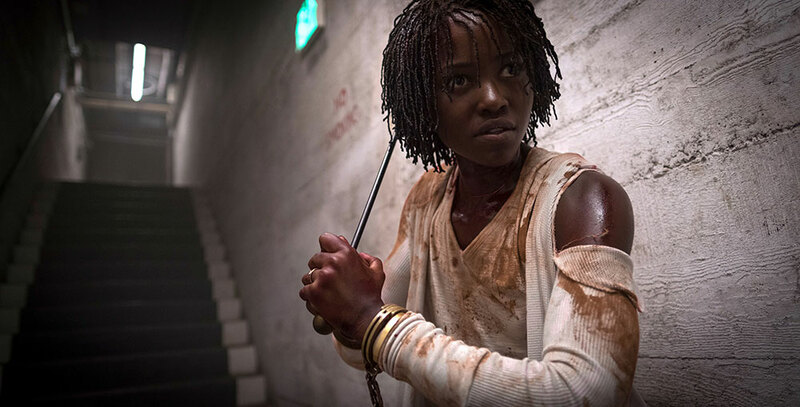 Us is an amazing follow-up to Get Out, especially after we’ve learned what a big fan Jordan Peele is of the horror genre. We get to see that even more with his second film, not just because it fits more easily into the category of horror than his debut, but also because of the references to classic horror films that he sprinkles throughout. There’s a lot about Us that is fun and funny — primarily the relationships and interactions within the family of protagonists. Just because this is scarier than Peele’s previous film doesn’t mean he’s lost his sense of humor. And all of the actors involved are delivering A+ performances across the spectrum: horrified, happy, worried, devoted and shocked. Plus they’re each playing two completely different characters! The whole movie could be a master class. The best thing I could say about the film is that I don’t know what the best part of it is. I’ve already mentioned the acting, but the script is so tight, as are the cinematography and direction — and the soundtrack is something special too. Each piece comes together to make this movie what it is. And I would be remiss not to mention the opening credits of Us, which are unsettling and mesmerizing, complete with haunting music. 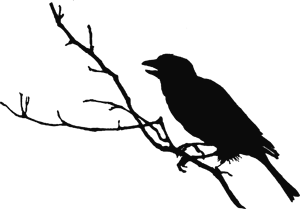 It’s no surprise that Peele’s debut was not a fluke, but this release just leaves me wanting to see everything he does that much more. This movie is definitely worth multiple rewatches. Us is a wildly successful feat pulled off by a one-man powerhouse of director, writer, and producer. 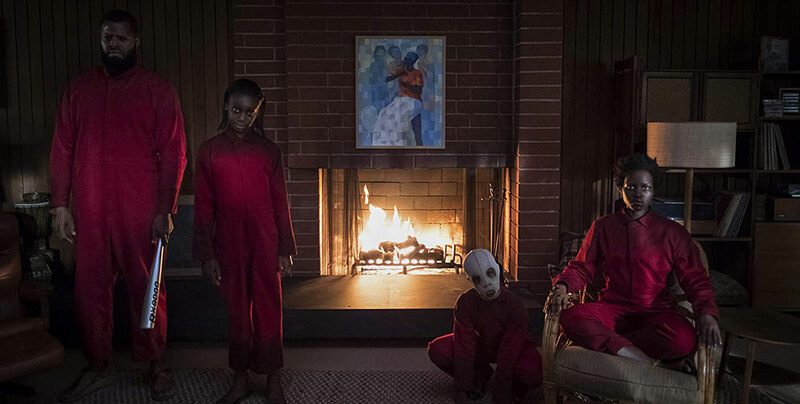 It leans towards a more traditional notion of horror with the amount of frights and suspense when compared to its predecessor Get Out but still acts a conduit for Peele’s earnest messages. While it does prove to be a satisfying theater experience, it leaves the audience with far too many questions and not of the philosophical flavor. Us follows a family returning to a vacation home near Santa Cruz. Adelaide (Lupita Nyong’o) had a traumatic experience there as a child and has a fear of the beach. Her husband Gabe (Winston Duke) encourages her to visit family friends at the beach with her children Zora (Shahadi Wright Joseph) and Jason (Evan Alex). Adelaide reluctantly agrees. That night, they are confronted back at their house by four figures who are all doppelgangers of them. All of the actors are phenomenal, especially Wright Johnson and Alex who both give remarkable performances considering their young ages. Both portray so much with their eyes, especially Wright Johnson who, as her doppelganger Umbrae, never utters a sound, but comes across as delightfully evil. But it is Lupita Nyong’o that is the heart of the movie. Portraying both Adelaide and her doppelganger, Red, Nyong’o is outstanding. Her emotional range portraying Adelaide as a parent intent of saving her family is heartbreaking and real. and her portrayal of Red as the near polar opposite with a robotic cruelness and reflexes is incredibly intense. Us is definitely a wonderful follow up to Get Out. Jordan Peele ratchets up the tension. My son and I saw the movie with two others who are newer to enjoying horror movies, and they both complained about being so tensed up during the movie that they were sore after the movie ended. Some of that tension belongs to composer Michael Abels, whose score hits all the right notes. Us isn’t perfect. I don’t want to include any spoilers, but the movie did leave me with more questions than I had going in. As a writer, I sometimes feel like Peele struggles with trying to keep his stories on track, but as a director, he can play an audience like a fiddle. Us takes a different turn than what I was expecting from the previews, but that isn’t necessarily a bad thing. It just leaves the movie open to interpretation and means we will probably still be discussing it long after it leaves the theaters. Twist endings only work, or pleasantly surprise audiences, when you cannot see them coming. Jordan Peele’s “Us,” while it is visually stimulating, thought-provoking and ultimately entertaining, suffers from the same fatal flaw that doomed the vastly overrated and overly celebrated “Get Out” (2017): The intended convolution can be seen a mile away. Peele isn’t fooling anyone, or surprising them during the finale, but he certainly knows how to make a haunting motion picture, nonetheless. Unfortunately, Peele loses his footing immediately as he undermines his own story, and the effectiveness of its narrative structure, by giving away the goods during the film’s opening sequence. It is obvious that the clone of Young Adelaide (Madison Curry) has swapped places with her counterpart. And even if you somehow didn’t put the pieces together immediately, there are clues sprinkled all through the film that the switch has taken place. Young Adelaide can’t speak when she returns from the house of mirrors, Adult Adelaide (Lupita Nyong’o) barks like the so-called Tethered when she dispatches the last of the twins (Cali and Noelle Sheldon) and Adult Red can speak when all the other Tethered grunt and moan only. Knowing that Adelaide and Red have swapped lives flat out ruins the end of the movie, period. Imagine, as a horror fan, that you knew Jason Voorhees was going to jump out of the lake at the end of “Friday the 13th” (1980). Would the end of “Psycho” (1960) have been as good if you knew Norman Bates was actually Mother? And what if you realized that Jigsaw (Tobin Bell) was the supposed dead body lying on the cell floor in “Saw” (2004)? No, the endings of those movies, and the films themselves, would not be iconic today. Now, the difference between “Get Out” and “Us” is that the latter is a good movie, but “Us” could have been unforgettable if the twist ending had truly been a surprise. While watching “Get Out,” it is clear that Chris’ (Daniel Kaluuya) girlfriend Rose (Allison Williams) is setting him up from the very beginning. It can’t be anyone else, because there are no other characters to throw you off her scent. Knowing Rose is the baddie ruins the end of “Get Out” and renders the bigger twist inert. What makes “Us” so good, if the end is so tragically flawed? There are a number of first-rate allusions to horror, sci-fi and pop culture peppered throughout “Us” that will have film fans blowing up social media and movie scholars analyzing for quite a while. There are those very familiar overalls sported by the Tethered which are also worn by another verbally-challenged horror movie character, Michael Myers. In this case, the Tethered have chosen to wear red uniforms in honor of their leader, Red. Clever, right? In addition to Michael Myers, the Tethered exhibit both the traits of zombies from any number of apocalyptic-themed movies (Night of the Living Dead, Dawn of the Dead, 28 Days Later) and the aliens in “Invasion of the Body Snatchers” (1956). “Us” features a creepy setting while appearing to pay homage to the “Friday the 13th” films with the classic house on the water, out in the middle of nowhere, along with the backdrop of the boardwalk that takes cinephiles back to Joel Schumacher’s “The Lost Boys” (1987). As the film progresses, audiences witness the warning of coming danger through the arrival of a massive flock of seagulls on the beach a la Alfred Hitchcock’s “The Birds” (1963). The Tethered, in addition to their red overalls, wear a single glove which is a nod to the glittery, white glove Michael Jackson often sported on one hand. Young Adelaide even rocks a “Thriller” t-shirt her father (Yahya Abdul-Mateen II) wins for her playing a carnival game. Peele is obviously a “Star Trek” fan, too. “Us” owes a great deal to the iconic episode of the original series titled “Mirror, Mirror” (1967). In that story, four members of the Enterprise crew transpose with their evil counterparts in a parallel universe after a freak ion storm adversely affects the transporter. The ion storm is now a beautifully-shot thunderstorm on the darkened beach in “Us” — lightning accentuating the black sky — with the house of mirrors that Young Adelaide enters acting as the Enterprise’s transporter. And during the mayhem, the transposition takes place. But evil Adelaide, aka the clone, doesn’t return to her universe. She stays, adapts and takes over the life of the true Adelaide. 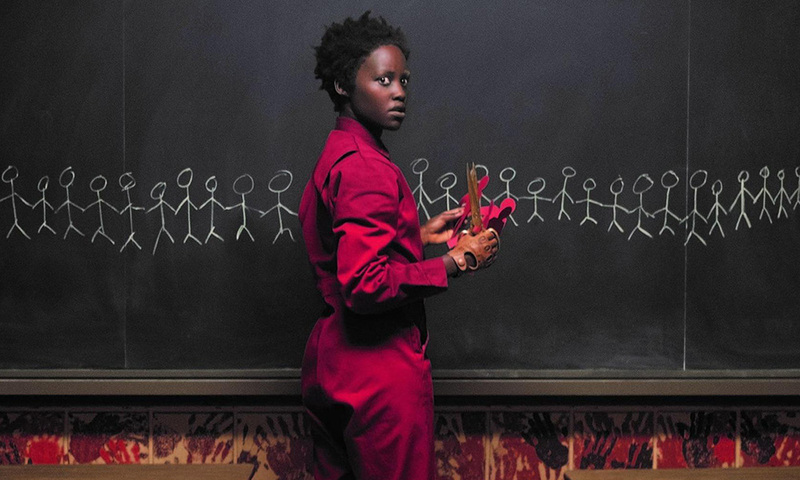 So, Lupita Nyong’o’s version of Red has every right to be angry. She was abducted and ripped from her life as a child, and now the jaded adult is on a revenge motif (a nod to all the classic revenge-based horror flicks like I Spit on Your Grave and Last House on the Left). If only Peele hadn’t screwed up the ending, right? Instead, we’d be talking about and celebrating near perfection in cinema. However, don’t gloss over the brilliance of a theme buried in the celluloid: environment affects who we become. The young clone evolves into a functioning human, as she grows to adulthood, in her new environment on the surface of the world. But the human child rapidly deteriorates in the harsh, unforgiving underground tunnels. Who is the true villain? Adelaide? Red? This begs audiences to see the film a second time to experience the story from the perspective of both women. So, the overall verdict is a positive one for “Us,” but the film could have been so much more: a legend in its own time perhaps. Technically, Peele knows his way around staging a shot. The scene of the family walking onto the beach for the first time, bathed in sunlight, with their shadows in tow is cinematic mastery. It is aesthetically pleasing while also showing, rather than telling, the story of the intertwined humans and Tethered in a subtle manner and without a word. And there is the character development. Adelaide’s son Jason (Evan Alex) and daughter Zora (Shahadi Wright Joseph) are both hybrids (humans and clones), and perhaps this explains how Jason is able to control his counterpart Pluto thus defeating him in the fire. What’s even more interesting is how the younger Jason is more clone than human — he is clearly still learning — while the older Zora is much more in touch with her humanity. 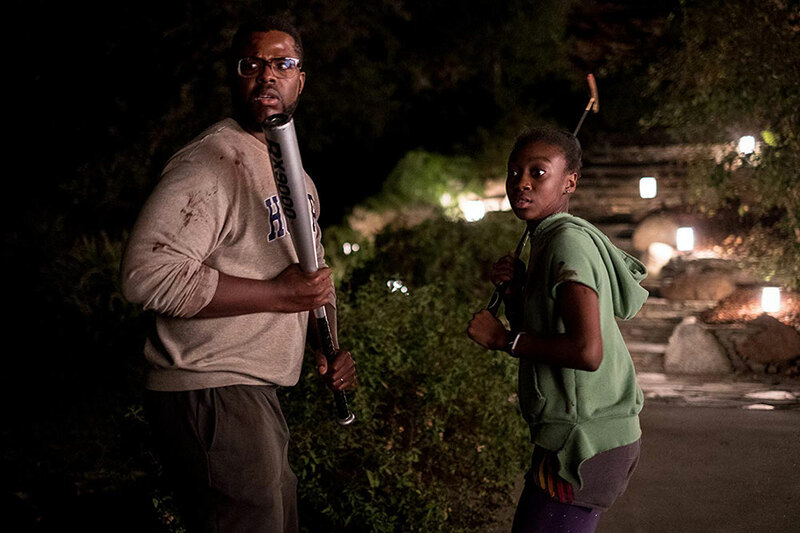 Also, the argument can be made that “Get Out” exists in the same universe as “Us,” and that the Armitage family and their weirdo friends and neighbors are the Tethered who have already invaded the surface world of our country. Regardless, Peele made major strides between “Get Out” and “Us,” so here is hoping his third picture will be the charm. The filmmaker has a promising future in horror, but he is not nearly at the level of Hitchcock, John Carpenter and Wes Craven yet. As a critic and a passionate genre fan, that puts me in a difficult spot. On one hand, I’m inclined to avoid waxing poetic on the artistic merits of Us and the remarkable talent and promise Peele demonstrates as a writer and director — so as not to add any unnecessary fuel to the “not worth the hype” fire. On the other hand, there is so much layered beauty and depth to this film that it’s hard not to want to lovingly dissect, analyze, and explore every frame to mine the treasure found both shining at the surface and that buried deep beneath — to uncover the soul of the film and what it reveals about society and human nature. 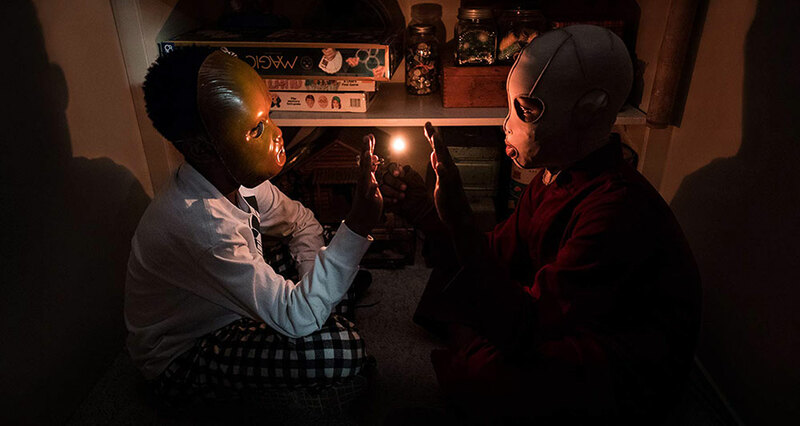 Before Us was released, I received blowback for entertaining the idea that Peele may one day be worthy of the title Master of Horror…or at least understanding the optimism and desire to see our beloved genre pass into the hands of a new generation talented enough to carry on the mantle of greatness for years to come. However, if it’s premature to call Peele the next Master of Horror, it’s difficult not to at least see him as a filmmaker well on his way to mastering his craft. Us proves he’s got a great deal to say, both about social injustice and man’s inhumanity to man as well as about the nature of fear and what terrifies us the most down in the darkest recesses of our minds. He makes it clear that he’s a true Horror fan, while also helping to elevate the genre and show that horror films can be as thought provoking as they are chilling. Peele has a real talent for casting the perfect people for his roles and eliciting remarkable performances from his actors. He also has a gift for using music to create the perfect mood and atmosphere. His films aren’t flawless, but they flirt with excellence in a way that’s difficult to dismiss out of hand. While Get Out may technically be a better film, Us is one hell of a fun ride that is likely more entertaining and utterly re-watchable.